The Maine Regional Reentry Center (MCRRC) in Belfast, Maine is a residential center designed to give incarcerated men the skills and experience they need to live successfully as citizens and employees after they transition into their home communities. Each week, the men are provided with over 40 hours of treatment, and educational and vocational opportunities focused upon reducing recidivism. Our evidence-based programming provides men with opportunities to practice newly acquired living skills. The interior of the Reentry Center is designed to provide security while also offering an environment to facilitate the transitional process necessary for long-term success once men have left the program. Your future success is our mission -- these are the first words seen as the men enter the program. Success is a partnership between the staff and residents with the clear goal of addressing issues that have impacted success in the past. There is a common room for studying and socializing and a kitchen with dining area that doubles as a classroom. 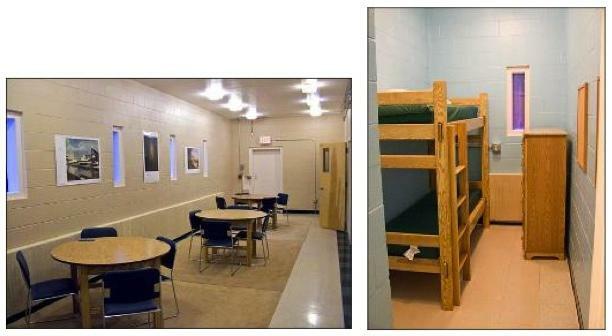 Each bedroom has two bunks and a dresser that were constructed at the Maine Correctional Center.The tables in the common rooms between each bedroom were also constructed at the Correctional Center. The Reentry Garden in Swanville is legendary and produces 80,000-100,000 pounds of fruits and vegetables every growing season. The food feeds the folks at MCRRC and is donated to churches, community food pantries, the YMCA and many other places in Belfast and neighboring communities. It is farmed exclusively by the MCRRC residents. Read the story here. Our Program partners include the Maine Department of Corrections, Maine Board of Corrections, Waldo County Sheriff's Office, and the Restorative Justice Project.